This afternoon I found on Larry Ferlazzo's blog a neat little resource for US History teachers. 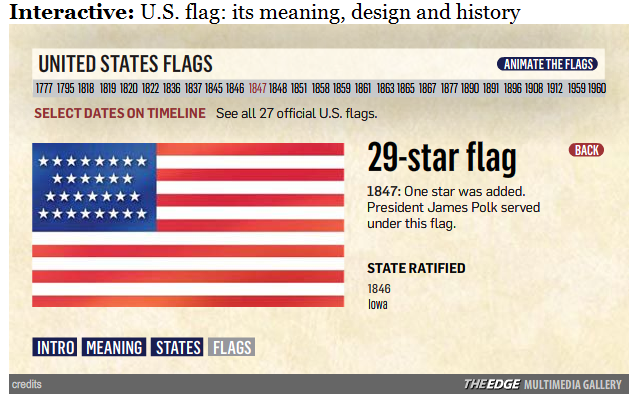 US Flag: Its Meaning, Design, and History is an interactive image produced by the Sun Sentinel. 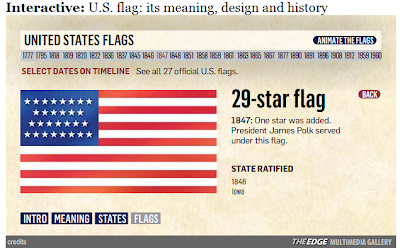 Click on the interactive image to learn what the colors, stripes, and stars symbolize. Click on the stars to learn which star represent which state. Finally, click on the "flags" tab to see a timeline of all of the flags used by the United States since 1777. Along the same lines, I found the following video overview of the history of US flags.